Our founder Marco Ferrario writes on the complexity of resilience. 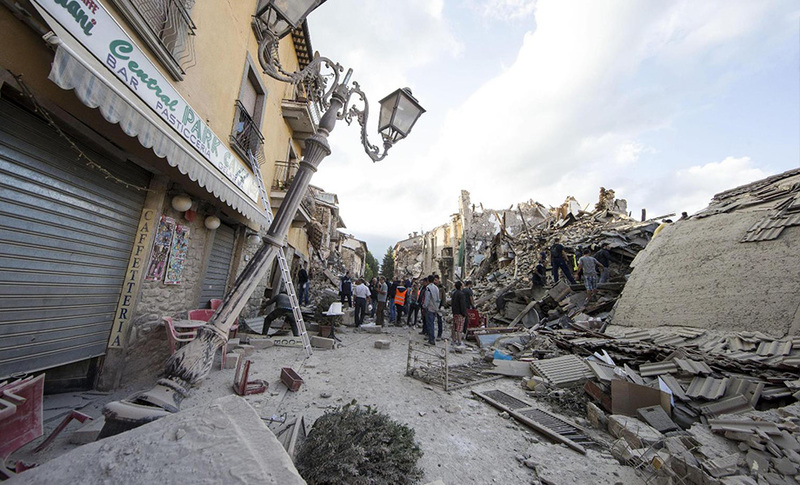 On 24th August, a 6.2 magnitude earthquake struck the centre of Italy and almost destroyed the town of Amatrice, also heavily damaging other villages and towns in the area. With almost 300 killed, it left thousands more without a roof over their heads apart from the damage to the infrastructure and disruption of the socio-economic aspects of their daily lives. A couple of weeks later, I was in Italy having a coffee with a friend when the images of the emergency camps came up on the news channel in the background and my friend asked me if the camp was only for the poor or for everyone. While my immediate response was that the tents being set by the Italian government response team were meant for everyone, it struck me that in reality, this was not the case. Living in a tent after a disaster is a really tough experience that anyone would want to avoid. I realized that families with a second home or with the financial capacity to secure another accommodation were probably not in those camps. For me, this highlighted the relative meaning of the word Resilience, today commonly used to refer to a risk that a region, a city or a community face and their ability to recover from it. An earthquake of a similar magnitude can have a much more devastating effect in China than in the US due to the difference in their quality of built environment. Furthermore, the socio-economically weaker communities within China might be more vulnerable to the same disaster when compared to others more well off. I have spent my last 7 years investigating the incremental housing context in India and other developing countries, it being an informal process that low-income communities follow to build or expand their most valuable asset, their homes. With no building regulations in place and no professional support, a majority of the resulting houses are poorly built with compromised structures, at a high risk in the unfortunate likelihood of earthquakes. In a city like Delhi, the quality and seismic safety of these buildings is drastically inferior to that of the buildings in the formal areas of the city. In other words, the resilience of the communities of the incrementally built settlements is much lower than that of the other groups. Today, over 420 million people live in Indian cities and of this; at least 75 million are residing in informal settlements. Based on our observation, we can say that almost a fifth of the Indian urban population is extremely vulnerable to climate-change induced events and natural hazards. The above estimate can be further added to by looking at the technical aspects of the buildings, geotechnical data (whether they are built on sandy or rocky soil) and ecological ones. By adding the socio- economic information as well, we can trace a resilience map of a city which is a complex exercise requiring a multidisciplinary approach. Developing such maps, in my opinion, should be a priority for the Indian government. Playing a critical role in minimizing the impact of disasters, these maps could be used to identify the areas with a low level of resilience and lead to specific policies and interventions to improve them. Other countries like Costa Rica followed this approach decades back. A group of professionals there, concerned by the poor quality of the units built incrementally and the frequency of earthquakes in the region, approached the Government and reviewed the building codes with the final aim to publish simple technical guidelines. Today, these simple manuals (mostly graphics) are still available in local stores across the country. As a result, the safety of buildings in poor communities there has now become seismically much safer and structurally acceptable. At mHS CITY LAB, we believe that this is the correct approach to improve the resilience of poor communities in our Indian cities and we are counting on technology to provide construction technical inputs and know-how to underserved communities.